September is here, so I'm ready to bust out the fall decor! I try to keep things somewhat neutral and avoid "Halloween" decorations. That way, I can keep everything up through Thanksgiving! I have a major pumpkin obsession, so they may just be covering the house! Since my fall decor is up the longest, I like to invest in some nicer things that will last. Last year, I bought the wheat wreath from Crate and Barrel & it's my favorite piece! So classic. 1 . 2 . 3 . 4 . 5 . 6 Please tell me I'm not the only one bursting with Fall excitement?! Me too! I'm so excited for fall! Bring on the boots and scarves! Oh yes I'm excited for fall! Love the wreath you got and ooh I want one of those luminated pumpkins! 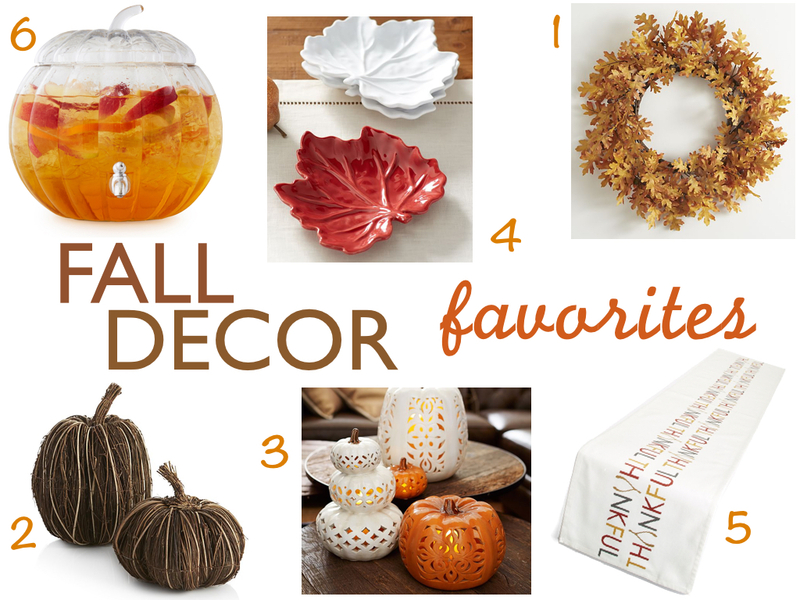 I need to invest in some fall decor! I'm still holding out until next Tuesday though - then Hobby Lobby, here I come!! I'm still going to pull out all the decor though, even though it will be over 100 degrees here, ha ha! I already put some fall stuff out! I love that Apple drink dispenser, that is soo cute! YES. The coziness of the season is irresistible. Loving those twig pumpkins!! the only fall decor i have is halloween stuff, lol. love that table runner! Aaakkk..I can't think of fall as it has been in the 90s all week. That wheat wreath is fantastic and makes me miss the 406! It's been a bit toasty here too, but the mornings are cool and there is a crispness in the air! Don't worry, you are not the only one excited!! LOVE the decor ideas. I just got a lighted, monogrammed pumpkin from Kirkland's and now I am getting in the fall decorating mood! Oh girl, I'm ALL ABOUT FALL! Only problem is, we pretty much don't get fall in CA. Whomp whomp. But I won't let that stop me from decorating and celebrating! I'll just be doing so in shorts and a t-shirt LOL. Oh well, I'll take what I can get. I don't know if I can even pick a favorite - I love them all! Okay, maybe the little leaf plates!